On 9 October 2015, the Securities and Futures Commission (SFC) announced new initiatives to fast track the authorisation process for new fund applications (Revamped Process) and to introduce a six-month application lapse policy for new Mandatory Provident Funds (MPF) and Pooled Retirement Fund (PRF) products. Both initiatives will take effect on 9 November 2015 for a six-month pilot period after which the initiatives may be refined before being adopted as policy. the number of funds authorised by the SFC in 2014 increased by more than one-third. The SFC believes that further reduction to the processing time is possible and proposes to focus more on key risks to meet fund providers' wish to reduce the "time to market" of their funds for public offering. To ensure the industry is sufficiently consulted on the process, the SFC formed a technical working group comprising representatives from industry associations, asset management companies, and the legal profession. 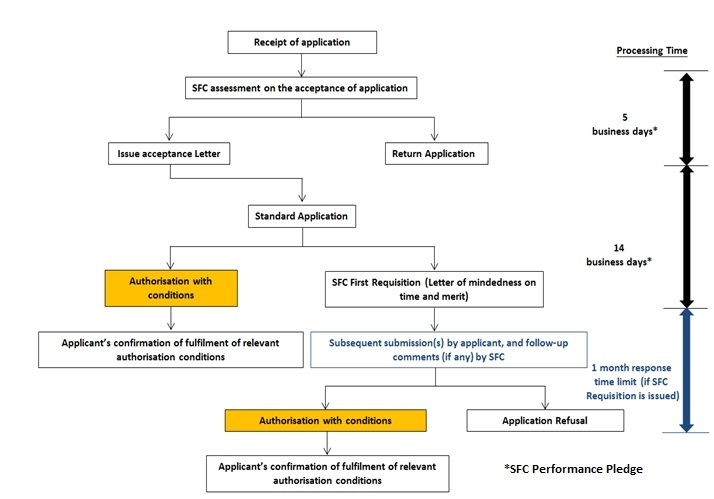 The SFC will adopt a "two-stream" approach when processing new fund applications with the support of the New Information Checklist and a comprehensive guide on practices and procedures for applications prepared by the SFC to facilitate application preparation and compliance with the relevant regulatory requirements (i.e. requirements under the SFC Handbook for Unit Trusts and Mutual Funds, Investment-Linked Assurance Schemes and Unlisted Structured Investment Products (Handbook) and the Code on Unit Trusts and Mutual Funds (UT Code)). there are no material issues and/or policy implications relating to the application as considered by the SFC. Applicants must provide 'proper, complete and substantive response(s)' to the SFC's requisition(s) within one month from the date of the first requisition issued. Failure to comply within this time limit can result in the refusal of the application, subject to the SFC's right to grant an extension at its sole discretion. The authorisation of Standard Applications may however be granted within 14 days from the acceptance date without issuing the first requisition. This stream aims to process applications under an enhanced process by granting SFC authorisation within an average of 2 to 3 months from the acceptance date of an application. 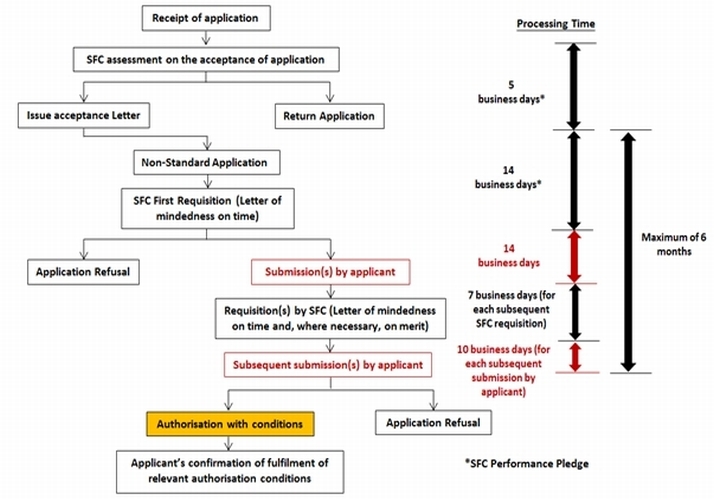 After taking up an application, the applicant will be given 14 business days to provide 'proper, complete and substantive response(s)' to the SFC's first requisition and 10 business days to respond to any subsequent requisitions; failure to comply within the time limit might result in the refusal of the application subject to the SFC's right to grant an extension at its sole discretion. Additionally, if an application is deemed to be incomplete and/or does not comply with the regulatory requirements, the SFC reserves its right not to process and to return the application to the applicant. In preparing their new fund applications, applicants should refer to the new Guide on Practices and Procedures for Application for Authorisation of Unit Trusts and Mutual Funds(see archive) (the Guide).4 The Guide sets out detailed guidance on the preparation of applications and compliance with the requirements of the Handbook and the UT Code. It also includes minimum disclosure requirements for the offering documents for certain types of SFC-authorised Funds. Reference should also be made to the new Information Checklist for Application for Authorisation of Unit Trusts and Mutual Funds which is available on the SFC website at http://www.sfc.hk/web/EN/forms/products/forms.html. a cheque made payable to "Securities and Futures Commission" for the relevant application fee. The SFC may require the submission of further documents or information during the vetting process. The fund's offering document must be in English and in traditional Chinese. For the traditional Chinese version, written confirmation is required regarding the truth and accuracy of the Chinese translation. any past record of non-compliance with the Handbook on the part of any relevant party to the application, refusal/rejection of application, or involuntary revocation/withdrawal of authorisation in respect of a prior application, made in Hong Kong or the home jurisdiction of the product in question relating to a product with materially similar structures or features. Where the SFC authorises a fund and the issue of its offering document subject to conditions, the applicant must fully comply with all the conditions set out in the SFC's authorisation letter in order for the authorisation to take effect. Generally, applicants are required to fulfil these conditions within 2 months from the date of the authorisation letter (or an extended time limit(s) that is agreed by the SFC upon the submission of an applicant). For the authorisation to take effect, the applicant must submit a duly completed and executed Confirmation of Fulfilment of Authorisation Conditions (a standard form) together with the required documents as stated in the authorisation letter. In the case of ETFs, the SFC will no longer grant approval-in-principle under the Revamped Process before an application is made to The Stock Exchange of Hong Kong Limited (HKEx) for listing approval. Instead, ETF authorisation will be granted subject to conditions including the listing approval having been obtained from HKEx. These conditions must be fulfilled before the SFC's authorisation becomes effective. The SFC pledges to (i) accept or refuse a new fund application within 5 business days upon receipt of the application, and (ii) issue the first set of requisitions/response to the new fund application within 14 business days from the acceptance date of the application. These pledges aim to ensure efficiency and to standardise performance for all new fund applications under the Revamped Process. All accepted applications will be subject to the above pledges and the Lapse Policy. To safeguard investor interests, applicants must duly discharge their compliance obligations and the SFC will conduct post-vetting to ensure all applicable authorisation conditions are complied with. Where appropriate, non-compliance can result in the SFC taking regulatory action. If 6 months have elapsed since the acceptance date and no authorisation has been granted, the application (whether it is a Standard or a Non-standard Application) will lapse subject to the SFC's right to grant an extension at its sole discretion. Only in limited circumstances will an extension be granted to a lapsed application. The application fee will not be refunded to the applicant. Charts 1 and 2 set out the Revamped Process for Standard and Non-Standard Applications. Please note that these are provided for illustrative purposes only. The SFC plans to implement both initiatives on 9 November 2015 for a six-month pilot period (ending on 8 May 2016). After the pilot period, the SFC may extend the Pilot Period or may make refinements before the initiatives will be adopted as policy. Applicants who wish to submit new fund applications between 9 October 2015 (announcement date) and 9 November 2015 (implementation date) should use the existing Information Checklist for Application for Authorisation of Unit Trusts and Mutual Funds for their applications. Applications that were received by the SFC prior to the implementation date will be subject to and processed by the SFC in accordance with the existing authorisation process subject to the Lapse Policy. The MRF arrangement is a new regulatory initiative (introduced in July 2015) between Mainland China and Hong Kong which permits Mainland and Hong Kong funds that meet the eligibility requirements to utilise streamlined procedures to obtain authorisation for offering to retail investors in each other's market. For the time being, the Revamped Process will not apply to MRF applications, although the SFC intends to assess the applicability of the Revamped Process for MRF applications after the expiry of the Pilot Period.